where our souls find rest. until Christmas to answer Him. What do you need from God this year? Ask and have faith that you will be cared for. The text posted for today was a great comfort to me. How True that we don't ever have to wait for a special time or place to find comfort in the arms of Jesus. We know this from by the Sacred Scriptures when Jesus invited all of us to come to Him. He is the Best Gift we could ever recieve! This thought is at times difficult to understand because of our limited intellect, and life's difficulties. Jesus knew this, and this is why He ALWAYS make Himself available to each of us. I also love the card posted for today. 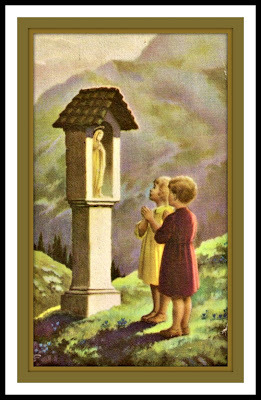 It reminds me of the outdoor shrines I used to see all over Bavaria (Germany) as a child. As the birthday of Jesus quickly approaches, let us once again reflect upon all the wonders Jesus has so lovingly bestowed upon us, and sing songs of Thanksgiving and Praise for the Joy of knowing, loving and being given the gift of Jesus Himself in the Blessed Eucharist! A Peace filled Day to all of your visitors Micki, and to you. I hope that you are not freezing because of the snow storm. Keep warm! John K.
Lovely prayer card and equally lovely words. Truly inspirational! Thank you for brightening our day. John K. - Thank you. I feel like I've had two wonderful homilies today. Mary Lou - Thank you for taking the time to leave a comment. Delighted to be your "light bulb" to "brighten your day". Welcome as a new commenter.